This article is about the brains of all types of animals, including humans. For information specific to the human brain, see Human brain. For other uses, see Brain (disambiguation) and Brains (disambiguation). Not to be confused with Brane or Brian. The brains of all species are composed primarily of two broad classes of cells: neurons and glial cells. Glial cells (also known as glia or neuroglia) come in several types, and perform a number of critical functions, including structural support, metabolic support, insulation, and guidance of development. Neurons, however, are usually considered the most important cells in the brain. The property that makes neurons unique is their ability to send signals to specific target cells over long distances. They send these signals by means of an axon, which is a thin protoplasmic fiber that extends from the cell body and projects, usually with numerous branches, to other areas, sometimes nearby, sometimes in distant parts of the brain or body. The length of an axon can be extraordinary: for example, if a pyramidal cell (an excitatory neuron) of the cerebral cortex were magnified so that its cell body became the size of a human body, its axon, equally magnified, would become a cable a few centimeters in diameter, extending more than a kilometer. These axons transmit signals in the form of electrochemical pulses called action potentials, which last less than a thousandth of a second and travel along the axon at speeds of 1–100 meters per second. Some neurons emit action potentials constantly, at rates of 10–100 per second, usually in irregular patterns; other neurons are quiet most of the time, but occasionally emit a burst of action potentials. 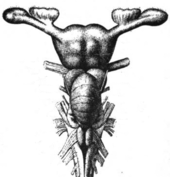 Nervous system of a generic bilaterian animal, in the form of a nerve cord with segmental enlargements, and a "brain" at the front. This category includes tardigrades, arthropods, molluscs, and numerous types of worms. The diversity of invertebrate body plans is matched by an equal diversity in brain structures. 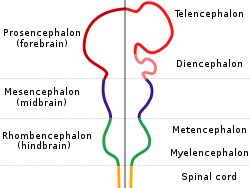 The main subdivisions of the embryonic vertebrate brain, which later differentiate into the forebrain, midbrain and hindbrain. Brain of a human embryo in the sixth week of development. 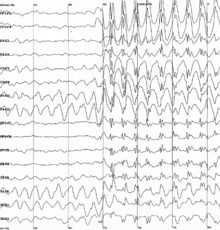 Brain electrical activity recorded from a human patient during an epileptic seizure. Brain tissue consumes a large amount of energy in proportion to its volume, so large brains place severe metabolic demands on animals. The need to limit body weight in order, for example, to fly, has apparently led to selection for a reduction of brain size in some species, such as bats. Most of the brain's energy consumption goes into sustaining the electric charge (membrane potential) of neurons. Most vertebrate species devote between 2% and 8% of basal metabolism to the brain. In primates, however, the percentage is much higher—in humans it rises to 20–25%. The energy consumption of the brain does not vary greatly over time, but active regions of the cerebral cortex consume somewhat more energy than inactive regions; this forms the basis for the functional brain imaging methods of PET, fMRI, and NIRS. The brain typically gets most of its energy from oxygen-dependent metabolism of glucose (i.e., blood sugar), but ketones provide a major alternative source, together with contributions from medium chain fatty acids (caprylic and heptanoic acids), lactate, acetate, and possibly amino acids. 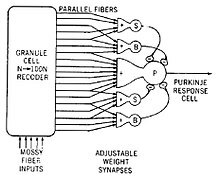 Model of a neural circuit in the cerebellum, as proposed by James S. Albus. 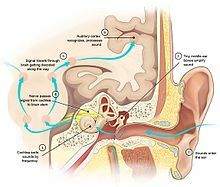 Diagram of signal processing in the auditory system. Cross-section of a human head, showing location of the hypothalamus. 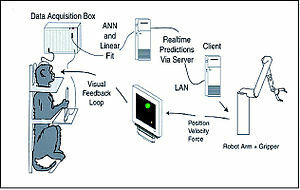 Design of an experiment in which brain activity from a monkey was used to control a robotic arm. Illustration by René Descartes of how the brain implements a reflex response. The first real progress toward a modern understanding of nervous function, though, came from the investigations of Luigi Galvani (1737–1798), who discovered that a shock of static electricity applied to an exposed nerve of a dead frog could cause its leg to contract. Since that time, each major advance in understanding has followed more or less directly from the development of a new technique of investigation. Until the early years of the 20th century, the most important advances were derived from new methods for staining cells. Particularly critical was the invention of the Golgi stain, which (when correctly used) stains only a small fraction of neurons, but stains them in their entirety, including cell body, dendrites, and axon. Without such a stain, brain tissue under a microscope appears as an impenetrable tangle of protoplasmic fibers, in which it is impossible to determine any structure. 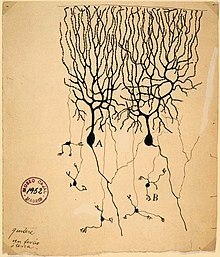 In the hands of Camillo Golgi, and especially of the Spanish neuroanatomist Santiago Ramón y Cajal, the new stain revealed hundreds of distinct types of neurons, each with its own unique dendritic structure and pattern of connectivity. Drawing by Santiago Ramón y Cajal of two types of Golgi-stained neurons from the cerebellum of a pigeon. 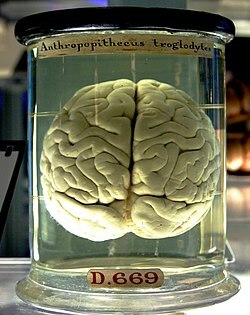 Animal brains are used as food in numerous cuisines. Some archaeological evidence suggests that the mourning rituals of European Neanderthals also involved the consumption of the brain. The Fore people of Papua New Guinea are known to eat human brains. In funerary rituals, those close to the dead would eat the brain of the deceased to create a sense of immortality. 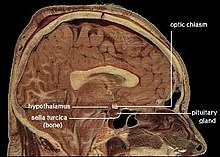 A prion disease called kuru has been traced to this. ^ Saladin, Kenneth (2011). Human anatomy (3rd ed.). McGraw-Hill. p. 416. ISBN 978-0-07-122207-5. ^ von Bartheld, CS; Bahney, J; Herculano-Houzel, S (15 December 2016). "The search for true numbers of neurons and glial cells in the human brain: A review of 150 years of cell counting". The Journal of Comparative Neurology. 524 (18): 3865–3895. doi:10.1002/cne.24040. PMC 5063692. PMID 27187682. ^ Yuste, Rafael; Church, George M. (March 2014). "The new century of the brain" (PDF). Scientific American. 310 (3): 38–45. Bibcode:2014SciAm.310c..38Y. doi:10.1038/scientificamerican0314-38. PMID 24660326. Archived from the original (PDF) on 2014-07-14. ^ a b c Shepherd, GM (1994). Neurobiology. Oxford University Press. p. 3. ISBN 978-0-19-508843-4. ^ Sporns, O (2010). Networks of the Brain. MIT Press. p. 143. ISBN 978-0-262-01469-4. ^ Başar, E (2010). Brain-Body-Mind in the Nebulous Cartesian System: A Holistic Approach by Oscillations. Springer. p. 225. ISBN 978-1-4419-6134-1. ^ Singh, I (2006). 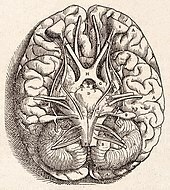 "A Brief Review of the Techniques Used in the Study of Neuroanatomy". Textbook of Human Neuroanatomy. Jaypee Brothers. p. 24. ISBN 978-81-8061-808-6. ^ a b c d e f g h i j k l m n o p q r s t u v w x y Kandel, Eric R.; Schwartz, James Harris; Jessell, Thomas M. (2000). Principles of neural science. New York: McGraw-Hill. ISBN 978-0-8385-7701-1. OCLC 42073108. ^ Douglas, RJ; Martin, KA (2004). "Neuronal circuits of the neocortex". Annual Review of Neuroscience. 27: 419–451. doi:10.1146/annurev.neuro.27.070203.144152. PMID 15217339. ^ Barnett, MW; Larkman, PM (2007). "The action potential". Practical Neurology. 7 (3): 192–197. PMID 17515599. ^ a b c Shepherd, GM (2004). "Ch. 1: Introduction to synaptic circuits". The Synaptic Organization of the Brain. Oxford University Press US. ISBN 978-0-19-515956-1. ^ Williams, RW; Herrup, K (1988). "The control of neuron number". Annual Review of Neuroscience. 11: 423–453. doi:10.1146/annurev.ne.11.030188.002231. PMID 3284447. ^ Heisenberg, M (2003). "Mushroom body memoir: from maps to models". Nature Reviews Neuroscience. 4 (4): 266–275. doi:10.1038/nrn1074. PMID 12671643. ^ a b Jacobs, DK; Nakanishi, N; Yuan, D; et al. (2007). "Evolution of sensory structures in basal metazoa". Integrative and Comparative Biology. 47 (5): 712–723. doi:10.1093/icb/icm094. PMID 21669752. ^ a b Balavoine, G (2003). "The segmented Urbilateria: A testable scenario". Integrative and Comparative Biology. 43 (1): 137–147. doi:10.1093/icb/43.1.137. PMID 21680418. ^ Schmidt-Rhaesa, A (2007). The Evolution of Organ Systems. Oxford University Press. p. 110. ISBN 978-0-19-856669-4. ^ Kristan Jr, WB; Calabrese, RL; Friesen, WO (2005). "Neuronal control of leech behavior". Prog Neurobiol. 76 (5): 279–327. doi:10.1016/j.pneurobio.2005.09.004. PMID 16260077. ^ Barnes, RD (1987). Invertebrate Zoology (5th ed.). Saunders College Pub. p. 1. ISBN 978-0-03-008914-5. ^ a b Butler, AB (2000). "Chordate Evolution and the Origin of Craniates: An Old Brain in a New Head". Anatomical Record. 261 (3): 111–125. doi:10.1002/1097-0185(20000615)261:3<111::AID-AR6>3.0.CO;2-F. PMID 10867629. ^ Bulloch, TH; Kutch, W (1995). "Are the main grades of brains different principally in numbers of connections or also in quality?". In Breidbach O (ed.). The nervous systems of invertebrates: an evolutionary and comparative approach. Birkhäuser. p. 439. ISBN 978-3-7643-5076-5. ^ "Flybrain: An online atlas and database of the drosophila nervous system". Archived from the original on 1998-01-09. Retrieved 2011-10-14. ^ Konopka, RJ; Benzer, S (1971). 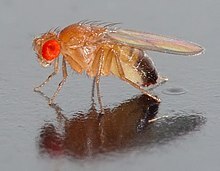 "Clock Mutants of Drosophila melanogaster". Proc. Natl. Acad. Sci. U.S.A. 68 (9): 2112–2116. Bibcode:1971PNAS...68.2112K. doi:10.1073/pnas.68.9.2112. PMC 389363. PMID 5002428. ^ Shin, Hee-Sup; et al. (1985). "An unusual coding sequence from a Drosophila clock gene is conserved in vertebrates". Nature. 317 (6036): 445–448. Bibcode:1985Natur.317..445S. doi:10.1038/317445a0. PMID 2413365. ^ Heisenberg, M; Heusipp, M; Wanke, C. (1995). "Structural plasticity in the Drosophila brain". J. Neurosci. 15 (3): 1951–1960. doi:10.1523/JNEUROSCI.15-03-01951.1995. ^ "WormBook: The online review of C. elegans biology". Retrieved 2011-10-14. ^ Hobert, O (2005). The C. elegans Research Community (ed.). "Specification of the nervous system". WormBook: 1–19. doi:10.1895/wormbook.1.12.1. PMC 4781215. PMID 18050401. ^ White, JG; Southgate, E; Thomson, JN; Brenner, S (1986). "The Structure of the Nervous System of the Nematode Caenorhabditis elegans". Philosophical Transactions of the Royal Society B. 314 (1165): 1–340. Bibcode:1986RSPTB.314....1W. doi:10.1098/rstb.1986.0056. PMID 22462104. ^ Jabr, Ferris (2012-10-02). "The Connectome Debate: Is Mapping the Mind of a Worm Worth It?". Scientific American. Retrieved 2014-01-18. ^ Kandel, ER (2007). In Search of Memory: The Emergence of a New Science of Mind. WW Norton. pp. 145–150. ISBN 978-0-393-32937-7. ^ Shu, D.-G.; Conway Morris, S.; Han, J.; Zhang, Z.-F.; Yasui, K.; Janvier, P.; Chen, L.; Zhang, X.-L.; Liu, J.-N.; et al. (2003). "Head and backbone of the Early Cambrian vertebrate Haikouichthys". Nature. 421 (6922): 526–529. Bibcode:2003Natur.421..526S. doi:10.1038/nature01264. PMID 12556891. ^ Striedter, GF (2005). "Ch. 3: Conservation in vertebrate brains". Principles of Brain Evolution. Sinauer Associates. ISBN 978-0-87893-820-9. ^ Armstrong, E (1983). "Relative brain size and metabolism in mammals". Science. 220 (4603): 1302–1304. Bibcode:1983Sci...220.1302A. doi:10.1126/science.6407108. PMID 6407108. ^ Jerison, HJ (1973). Evolution of the Brain and Intelligence. Academic Press. pp. 55–74. ISBN 978-0-12-385250-2. ^ Parent, A; Carpenter, MB (1995). "Ch. 1". Carpenter's Human Neuroanatomy. Williams & Wilkins. ISBN 978-0-683-06752-1. ^ Pardridge, W (2005). "The Blood-Brain Barrier: Bottleneck in Brain Drug Development". NeuroRx. 2 (1): 3–14. doi:10.1602/neurorx.2.1.3. PMC 539316. PMID 15717053. ^ Northcutt, RG (2008). "Forebrain evolution in bony fishes". Brain Research Bulletin. 75 (2–4): 191–205. doi:10.1016/j.brainresbull.2007.10.058. PMID 18331871. ^ Reiner, A; Yamamoto, K; Karten, HJ (2005). "Organization and evolution of the avian forebrain". The Anatomical Record Part A: Discoveries in Molecular, Cellular, and Evolutionary Biology. 287 (1): 1080–1102. doi:10.1002/ar.a.20253. PMID 16206213. ^ Siegel, A; Sapru, HN (2010). Essential Neuroscience. Lippincott Williams & Wilkins. pp. 184–189. ISBN 978-0-7817-8383-5. ^ Swaab, DF; Boller, F; Aminoff, MJ (2003). The Human Hypothalamus. Elsevier. ISBN 978-0-444-51357-1. ^ Jones, EG (1985). The Thalamus. Plenum Press. ISBN 978-0-306-41856-3. ^ Knierim, James (2015). "Cerebellum" (Section 3, Chapter 5) Neuroscience Online. Department of Neurobiology and Anatomy – The University of Texas Medical School at Houston. ^ Saitoh, K; Ménard, A; Grillner, S (2007). "Tectal control of locomotion, steering, and eye movements in lamprey". Journal of Neurophysiology. 97 (4): 3093–3108. doi:10.1152/jn.00639.2006. PMID 17303814. ^ Richard Swann Lull; Harry Burr Ferris; George Howard Parker; James Rowland Angell; Albert Galloway Keller; Edwin Grant Conklin (1922). The evolution of man: a series of lectures delivered before the Yale chapter of the Sigma xi during the academic year 1921–1922. Yale University Press. p. 50. ^ Puelles, L (2001). "Thoughts on the development, structure and evolution of the mammalian and avian telencephalic pallium". Philosophical Transactions of the Royal Society B. 356 (1414): 1583–1598. doi:10.1098/rstb.2001.0973. PMC 1088538. PMID 11604125. ^ Salas, C; Broglio, C; Rodríguez, F (2003). "Evolution of forebrain and spatial cognition in vertebrates: conservation across diversity". Brain, Behavior and Evolution. 62 (2): 72–82. doi:10.1159/000072438. PMID 12937346. ^ a b Grillner, S; et al. (2005). "Mechanisms for selection of basic motor programs—roles for the striatum and pallidum". Trends in Neurosciences. 28 (7): 364–370. doi:10.1016/j.tins.2005.05.004. PMID 15935487. ^ Northcutt, RG (1981). 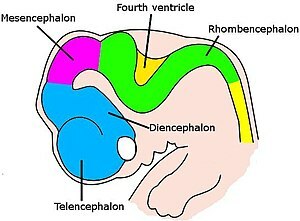 "Evolution of the telencephalon in nonmammals". Annual Review of Neuroscience. 4: 301–350. doi:10.1146/annurev.ne.04.030181.001505. PMID 7013637. ^ a b Northcutt, RG (2002). 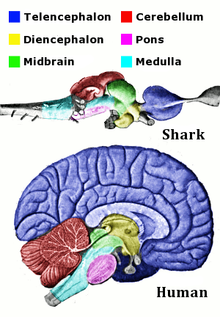 "Understanding vertebrate brain evolution". Integrative and Comparative Biology. 42 (4): 743–756. doi:10.1093/icb/42.4.743. PMID 21708771. ^ a b Barton, RA; Harvey, PH (2000). "Mosaic evolution of brain structure in mammals". Nature. 405 (6790): 1055–1058. Bibcode:2000Natur.405.1055B. doi:10.1038/35016580. PMID 10890446. ^ Aboitiz, F; Morales, D; Montiel, J (2003). "The evolutionary origin of the mammalian isocortex: Towards an integrated developmental and functional approach". Behavioral and Brain Sciences. 26 (5): 535–552. doi:10.1017/S0140525X03000128. PMID 15179935. Archived from the original on 2008-08-07. ^ Romer, AS; Parsons, TS (1977). The Vertebrate Body. Holt-Saunders International. p. 531. ISBN 978-0-03-910284-5. ^ a b Roth, G; Dicke, U (2005). "Evolution of the brain and Intelligence". Trends in Cognitive Sciences. 9 (5): 250–257. doi:10.1016/j.tics.2005.03.005. PMID 15866152. ^ a b Marino, Lori (2004). "Cetacean Brain Evolution: Multiplication Generates Complexity" (PDF). International Society for Comparative Psychology (17): 1–16. Retrieved 2010-08-29. ^ Shoshani, J; Kupsky, WJ; Marchant, GH (2006). "Elephant brain Part I: Gross morphology, functions, comparative anatomy, and evolution". Brain Research Bulletin. 70 (2): 124–157. doi:10.1016/j.brainresbull.2006.03.016. PMID 16782503. ^ Finlay, BL; Darlington, RB; Nicastro, N (2001). "Developmental structure in brain evolution". Behavioral and Brain Sciences. 24 (2): 263–308. doi:10.1017/S0140525X01003958. PMID 11530543. ^ Calvin, WH (1996). How Brains Think. Basic Books. ISBN 978-0-465-07278-1. ^ Sereno, MI; Dale, AM; Reppas, AM; Kwong, KK; Belliveau, JW; Brady, TJ; Rosen, BR; Tootell, RBH (1995). "Borders of multiple visual areas in human revealed by functional magnetic resonance imaging" (PDF). Science. 268 (5212): 889–893. Bibcode:1995Sci...268..889S. doi:10.1126/science.7754376. PMID 7754376. ^ Fuster, JM (2008). The Prefrontal Cortex. Elsevier. pp. 1–7. ISBN 978-0-12-373644-4. ^ a b c d e f g Purves, Dale. ; Lichtman, Jeff W. (1985). Principles of neural development. Sunderland, Mass. : Sinauer Associates. ISBN 978-0-87893-744-8. OCLC 10798963. ^ a b Wong, R (1999). "Retinal waves and visual system development". Annual Review of Neuroscience. 22: 29–47. doi:10.1146/annurev.neuro.22.1.29. PMID 10202531. ^ Rakic, P (2002). "Adult neurogenesis in mammals: an identity crisis". Journal of Neuroscience. 22 (3): 614–618. doi:10.1523/JNEUROSCI.22-03-00614.2002. PMID 11826088. ^ Ridley, M (2003). Nature via Nurture: Genes, Experience, and What Makes Us Human. Forth Estate. pp. 1–6. ISBN 978-0-06-000678-5. ^ Wiesel, T (1982). "Postnatal development of the visual cortex and the influence of environment" (PDF). Nature. 299 (5884): 583–591. Bibcode:1982Natur.299..583W. CiteSeerX 10.1.1.547.7497. doi:10.1038/299583a0. PMID 6811951. ^ van Praag, H; Kempermann, G; Gage, FH (2000). "Neural consequences of environmental enrichment". Nature Reviews Neuroscience. 1 (3): 191–198. doi:10.1038/35044558. PMID 11257907. ^ Cooper, JR; Bloom, FE; Roth, RH (2003). The Biochemical Basis of Neuropharmacology. Oxford University Press US. ISBN 978-0-19-514008-8. ^ McGeer, PL; McGeer, EG (1989). "Chapter 15, Amino acid neurotransmitters". In G. Siegel; et al. (eds.). Basic Neurochemistry. Raven Press. pp. 311–332. ISBN 978-0-88167-343-2. ^ Foster, AC; Kemp, JA (2006). "Glutamate- and GABA-based CNS therapeutics". Current Opinion in Pharmacology. 6 (1): 7–17. doi:10.1016/j.coph.2005.11.005. PMID 16377242. ^ Frazer, A; Hensler, JG (1999). "Understanding the neuroanatomical organization of serotonergic cells in the brain provides insight into the functions of this neurotransmitter". In Siegel, GJ (ed.). Basic Neurochemistry (Sixth ed.). Lippincott Williams & Wilkins. ISBN 978-0-397-51820-3. ^ Mehler, MF; Purpura, DP (2009). "Autism, fever, epigenetics and the locus coeruleus". Brain Research Reviews. 59 (2): 388–392. doi:10.1016/j.brainresrev.2008.11.001. PMC 2668953. PMID 19059284. ^ Rang, HP (2003). Pharmacology. Churchill Livingstone. pp. 476–483. ISBN 978-0-443-07145-4. ^ a b Buzsáki, G (2006). Rhythms of the Brain. Oxford University Press. ISBN 978-0-19-530106-9. OCLC 63279497. ^ a b c Nieuwenhuys, R; Donkelaar, HJ; Nicholson, C (1998). The Central Nervous System of Vertebrates, Volume 1. Springer. pp. 11–14. ISBN 978-3-540-56013-5. ^ Safi, K; Seid, MA; Dechmann, DK (2005). "Bigger is not always better: when brains get smaller". Biology Letters. 1 (3): 283–286. doi:10.1098/rsbl.2005.0333. PMC 1617168. PMID 17148188. ^ Mink, JW; Blumenschine, RJ; Adams, DB (1981). "Ratio of central nervous system to body metabolism in vertebrates: its constancy and functional basis". American Journal of Physiology (Submitted manuscript). 241 (3): R203–212. doi:10.1152/ajpregu.1981.241.3.R203. PMID 7282965. ^ Raichle, M; Gusnard, DA (2002). "Appraising the brain's energy budget". Proc. Natl. Acad. Sci. U.S.A. 99 (16): 10237–10239. Bibcode:2002PNAS...9910237R. doi:10.1073/pnas.172399499. PMC 124895. PMID 12149485. ^ Mehagnoul-Schipper, DJ; Van Der Kallen, BF; Colier, WNJM; Van Der Sluijs, MC; Van Erning, LJ; Thijssen, HO; Oeseburg, B; Hoefnagels, WH; Jansen, RW (2002). "Simultaneous measurements of cerebral oxygenation changes during brain activation by near-infrared spectroscopy and functional magnetic resonance imaging in healthy young and elderly subjects". Hum Brain Mapp. 16 (1): 14–23. doi:10.1002/hbm.10026. PMID 11870923. ^ Ebert, D.; Haller, RG. ; Walton, ME. (Jul 2003). "Energy contribution of octanoate to intact rat brain metabolism measured by 13C nuclear magnetic resonance spectroscopy". J Neurosci. 23 (13): 5928–5935. doi:10.1523/JNEUROSCI.23-13-05928.2003. PMID 12843297. ^ Marin-Valencia, I.; Good, LB. ; Ma, Q.; Malloy, CR. ; Pascual, JM. (Feb 2013). "Heptanoate as a neural fuel: energetic and neurotransmitter precursors in normal and glucose transporter I-deficient (G1D) brain". J Cereb Blood Flow Metab. 33 (2): 175–182. doi:10.1038/jcbfm.2012.151. PMC 3564188. PMID 23072752. ^ Boumezbeur, F.; Petersen, KF. ; Cline, GW. ; Mason, GF. ; Behar, KL. ; Shulman, GI. ; Rothman, DL. (Oct 2010). "The contribution of blood lactate to brain energy metabolism in humans measured by dynamic 13C nuclear magnetic resonance spectroscopy". J Neurosci. 30 (42): 13983–13991. doi:10.1523/JNEUROSCI.2040-10.2010. PMC 2996729. PMID 20962220. ^ Deelchand, DK. ; Shestov, AA. ; Koski, DM. ; Uğurbil, K.; Henry, PG. (May 2009). "Acetate transport and utilization in the rat brain". J Neurochem. 109 Suppl 1 (Suppl 1): 46–54. doi:10.1111/j.1471-4159.2009.05895.x. PMC 2722917. PMID 19393008. ^ Soengas, JL; Aldegunde, M (2002). "Energy metabolism of fish brain". Comparative Biochemistry and Physiology B. 131 (3): 271–296. doi:10.1016/S1096-4959(02)00022-2. PMID 11959012. ^ a b Carew, TJ (2000). "Ch. 1". Behavioral Neurobiology: the Cellular Organization of Natural Behavior. Sinauer Associates. ISBN 978-0-87893-092-0. ^ Dafny, N. "Anatomy of the spinal cord". Neuroscience Online. Archived from the original on 2011-10-08. Retrieved 2011-10-10. ^ Dragoi, V. "Ocular motor system". Neuroscience Online. Archived from the original on 2011-11-17. Retrieved 2011-10-10. ^ Gurney, K; Prescott, TJ; Wickens, JR; Redgrave, P (2004). "Computational models of the basal ganglia: from robots to membranes". Trends in Neurosciences. 27 (8): 453–459. doi:10.1016/j.tins.2004.06.003. PMID 15271492. ^ Shima, K; Tanji, J (1998). "Both supplementary and presupplementary motor areas are crucial for the temporal organization of multiple movements". Journal of Neurophysiology. 80 (6): 3247–3260. doi:10.1152/jn.1998.80.6.3247. PMID 9862919. ^ Miller, EK; Cohen, JD (2001). "An integrative theory of prefrontal cortex function". Annual Review of Neuroscience. 24 (1): 167–202. doi:10.1146/annurev.neuro.24.1.167. PMID 11283309. ^ Antle, MC; Silver, R (2005). "Orchestrating time: arrangements of the brain circadian clock" (PDF). Trends in Neurosciences. 28 (3): 145–151. doi:10.1016/j.tins.2005.01.003. PMID 15749168. Archived from the original (PDF) on 2008-10-31. ^ Kleitman, N (1938). Sleep and Wakefulness. revised 1963, reprinted 1987. The University of Chicago Press, Midway Reprints series. ISBN 978-0-226-44073-6. ^ a b c Dougherty, P. "Hypothalamus: structural organization". Neuroscience Online. Archived from the original on 2011-11-17. Retrieved 2011-10-11. ^ Gross, CG (1998). "Claude Bernard and the constancy of the internal environment" (PDF). The Neuroscientist. 4 (5): 380–385. doi:10.1177/107385849800400520. ^ Dougherty, P. "Hypothalamic control of pituitary hormone". Neuroscience Online. Archived from the original on 2011-11-17. Retrieved 2011-10-11. ^ Chiel, HJ; Beer, RD (1997). "The brain has a body: adaptive behavior emerges from interactions of nervous system, body, and environment". Trends in Neurosciences. 20 (12): 553–557. doi:10.1016/S0166-2236(97)01149-1. PMID 9416664. ^ Berridge, KC (2004). "Motivation concepts in behavioral neuroscience". Physiology & Behavior. 81 (2): 179–209. doi:10.1016/j.physbeh.2004.02.004. PMID 15159167. ^ Ardiel, EL; Rankin, CH (2010). "An elegant mind: learning and memory in Caenorhabditis elegans". Learning and Memory. 17 (4): 191–201. doi:10.1101/lm.960510. PMID 20335372. ^ Hyman, SE; Malenka, RC (2001). "Addiction and the brain: the neurobiology of compulsion and its persistence". Nature Reviews Neuroscience. 2 (10): 695–703. doi:10.1038/35094560. PMID 11584307. ^ Ramón y Cajal, S (1894). "The Croonian Lecture: La Fine Structure des Centres Nerveux". Proceedings of the Royal Society. 55 (331–335): 444–468. doi:10.1098/rspl.1894.0063. ^ Lømo, T (2003). "The discovery of long-term potentiation". Philosophical Transactions of the Royal Society B. 358 (1432): 617–620. doi:10.1098/rstb.2002.1226. PMC 1693150. PMID 12740104. ^ Malenka, R; Bear, M (2004). "LTP and LTD: an embarrassment of riches". Neuron. 44 (1): 5–21. doi:10.1016/j.neuron.2004.09.012. PMID 15450156. ^ a b Bos, I; De Boever, P; Int Panis, L; Meeusen, R (August 2014). "Physical Activity, Air Pollution and the Brain". Sports Medicine. 44 (11): 1505–1518. doi:10.1007/s40279-014-0222-6. PMID 25119155. ^ Curtis, CE; D'Esposito, M (2003). "Persistent activity in the prefrontal cortex during working memory". Trends in Cognitive Sciences. 7 (9): 415–423. CiteSeerX 10.1.1.457.9723. doi:10.1016/S1364-6613(03)00197-9. PMID 12963473. ^ Tulving, E; Markowitsch, HJ (1998). "Episodic and declarative memory: role of the hippocampus". Hippocampus. 8 (3): 198–204. doi:10.1002/(SICI)1098-1063(1998)8:3<198::AID-HIPO2>3.0.CO;2-G. PMID 9662134. ^ Martin, A; Chao, LL (2001). "Semantic memory and the brain: structures and processes". Current Opinion in Neurobiology. 11 (2): 194–201. doi:10.1016/S0959-4388(00)00196-3. PMID 11301239. ^ Balleine, BW; Liljeholm, Mimi; Ostlund, SB (2009). "The integrative function of the basal ganglia in instrumental learning". Behavioural Brain Research. 199 (1): 43–52. doi:10.1016/j.bbr.2008.10.034. PMID 19027797. ^ Doya, K (2000). "Complementary roles of basal ganglia and cerebellum in learning and motor control". Current Opinion in Neurobiology. 10 (6): 732–739. doi:10.1016/S0959-4388(00)00153-7. PMID 11240282. ^ Storrow, Hugh A. (1969). Outline of clinical psychiatry. New York: Appleton-Century-Crofts, Educational Division. ISBN 978-0-390-85075-1. OCLC 47198. ^ Thagard, P (2008). Zalta, EN (ed.). "Cognitive Science". The Stanford Encyclopedia of Philosophy. Retrieved 2011-10-14. ^ Bear, MF; Connors, BW; Paradiso, MA (2007). "Ch. 2". 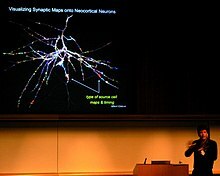 Neuroscience: Exploring the Brain. Lippincott Williams & Wilkins. ISBN 978-0-7817-6003-4. ^ Dowling, JE (2001). Neurons and Networks. Harvard University Press. pp. 15–24. ISBN 978-0-674-00462-7. ^ Wyllie, E; Gupta, A; Lachhwani, DK (2005). "Ch. 77". The Treatment of Epilepsy: Principles and Practice. Lippincott Williams & Wilkins. ISBN 978-0-7817-4995-4. ^ Carmena, JM; et al. (2003). "Learning to Control a Brain–Machine Interface for Reaching and Grasping by Primates". PLoS Biology. 1 (2): 193–208. doi:10.1371/journal.pbio.0000042. PMC 261882. PMID 14624244. ^ Kolb, B; Whishaw, I (2008). "Ch. 1". Fundamentals of Human Neuropsychology. Macmillan. ISBN 978-0-7167-9586-5. ^ Abbott, LF; Dayan, P (2001). "Preface". Theoretical Neuroscience: Computational and Mathematical Modeling of Neural Systems. MIT Press. ISBN 978-0-262-54185-5. ^ a b c Tonegawa, S; Nakazawa, K; Wilson, MA (2003). "Genetic neuroscience of mammalian learning and memory". Philosophical Transactions of the Royal Society B. 358 (1432): 787–795. doi:10.1098/rstb.2002.1243. PMC 1693163. PMID 12740125. ^ a b Finger, S (2001). Origins of Neuroscience. Oxford University Press. pp. 14–15. ISBN 978-0-19-514694-3. ^ Finger, S (2001). Origins of Neuroscience. Oxford University Press. pp. 193–195. ISBN 978-0-19-514694-3. ^ Shepherd, GM (1991). "Ch.1 : Introduction and Overview". Foundations of the Neuron Doctrine. Oxford University Press. ISBN 978-0-19-506491-9. ^ Piccolino, M (2002). "Fifty years of the Hodgkin-Huxley era". Trends in Neurosciences. 25 (11): 552–553. doi:10.1016/S0166-2236(02)02276-2. PMID 12392928. ^ Sherrington, CS (1942). Man on his nature. Cambridge University Press. p. 178. ISBN 978-0-8385-7701-1. ^ a b c Churchland, PS; Koch, C; Sejnowski, TJ (1993). "What is computational neuroscience?". In Schwartz EL (ed.). Computational Neuroscience. MIT Press. pp. 46–55. ISBN 978-0-262-69164-2. ^ von Neumann, J; Churchland, PM; Churchland, PS (2000). The Computer and the Brain. Yale University Press. pp. xi–xxii. ISBN 978-0-300-08473-3. ^ Lettvin, JY; Maturana, HR; McCulloch, WS; Pitts, WH (1959). "What the frog's eye tells the frog's brain" (PDF). Proceedings of the Institute of Radio Engineers. 47 (11): 1940–1951. doi:10.1109/jrproc.1959.287207. Archived from the original (PDF) on 2011-09-28. ^ Hubel, DH; Wiesel, TN (2005). Brain and visual perception: the story of a 25-year collaboration. Oxford University Press US. pp. 657–704. ISBN 978-0-19-517618-6. ^ Farah, MJ (2000). The Cognitive Neuroscience of Vision. Wiley-Blackwell. pp. 1–29. ISBN 978-0-631-21403-8. ^ Engel, AK; Singer, W (2001). "Temporal binding and the neural correlates of sensory awareness". Trends in Cognitive Sciences. 5 (1): 16–25. doi:10.1016/S1364-6613(00)01568-0. PMID 11164732. ^ Dayan, P; Abbott, LF (2005). "Ch.7: Network models". Theoretical Neuroscience. MIT Press. ISBN 978-0-262-54185-5. ^ Averbeck, BB; Lee, D (2004). "Coding and transmission of information by neural ensembles". Trends in Neurosciences. 27 (4): 225–230. doi:10.1016/j.tins.2004.02.006. PMID 15046882. ^ Forrest, MD (2014). "Intracellular Calcium Dynamics Permit a Purkinje Neuron Model to Perform Toggle and Gain Computations Upon its Inputs". Frontiers in Computational Neuroscience. 8: 86. doi:10.3389/fncom.2014.00086. PMC 4138505. PMID 25191262. ^ Jones, EG; Mendell, LM (1999). "Assessing the Decade of the Brain". Science. 284 (5415): 739. Bibcode:1999Sci...284..739J. doi:10.1126/science.284.5415.739. PMID 10336393. ^ Buzsáki, G (2004). "Large-scale recording of neuronal ensembles" (PDF). Nature Neuroscience. 7 (5): 446–451. doi:10.1038/nn1233. PMID 15114356. Archived from the original (PDF) on 2006-09-10. ^ Geschwind, DH; Konopka, G (2009). "Neuroscience in the era of functional genomics and systems biology". Nature. 461 (7266): 908–915. Bibcode:2009Natur.461..908G. doi:10.1038/nature08537. PMC 3645852. PMID 19829370. ^ Connell, Evan S. (2001). The Aztec Treasure House. Counterpoint Press. ISBN 978-1-58243-162-8. ^ Collins, S; McLean CA; Masters CL (2001). "Gerstmann-Straussler-Scheinker syndrome, fatal familial insomnia, and kuru: a review of these less common human transmissible spongiform encephalopathies". Journal of Clinical Neuroscience. 8 (5): 387–397. doi:10.1054/jocn.2001.0919. PMID 11535002.